← Random Panel: Next up on "Heroes Gone Wild"! 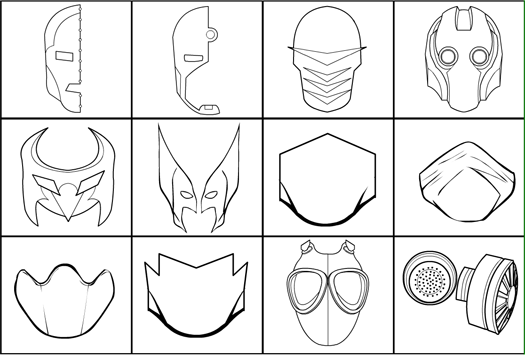 Note that I have included several different "pieces" for you to use in assembling your own custom mask if you like. For instance, in the preview above the item on the bottom row, second from the left is meant to be colored as if it were flesh, and combined with a full-head colored as a cloth mask. This allows you to make a straight-lined mask open at the top to let the hair spill out with either a curved Captain America-style mouth opening, or one like you see here, or one of the alternates. Or you could swap out the straight-line top portion with a curved one. You can also use the dedicated "eye hole" items from the "EyesStandard" set to further customize your headgear. Similarly, the gas mask you see in the last two items of the preview are meant to be used together. But I thought the purely mask portion was pretty neat looking, so I made it a standalone. And you can now combine the filter portion with any of the other masks for your own unique look. As usual, holler if you see any bugs or problems, or if there's a Mask item you really wanted to see but that didn't make it. Are you going to bunch these together. Like take the eye patch, and mask parts from under the “standard” and put them under the “masks” It just makes it easier overall. thx so much for the FF:SW mask i love it man! @rodney: I did that, including specifically the mask parts and the eye patch that you mention. I pulled in all of the specifically mask parts of HeadgearStandard and a couple from HeadgearMilitary. Cool can’t wait to use them. This thing is really starting to take shape, Jeff! Great work, but I do have a bug report concerning the new “load” and “save” features. I created an HM 3 version of a character I’d previously made in HM 2.5 and saved and reloaded the new version to see how well the save and reload features work. Apparently the reload feature doesn’t always “remember” where certain items are in relation to other items and layers or slots. After I reloaded the character, I had to spend a couple of minutes moving items to the back or front as necessary so that the character would look right. No items were missing–they just were in the wrong place. For example, if I meant to show the character carrying a long sword in a scabbard slung across his back, on reloading the sword usually was placed behind the background layer. I had to select the thumbnail drawing of the sword (still marked, so I knew it was there) and click the “layer up” button several times until the sword was in the right place relative to the character’s body and the other items in his costume. maybe you should add Scarlet Witch’s crownish tiara. I would love to see some new styles of glasses. Nice job, Jeff. Thanx a lot d00d! @MCTales: I’ll be working on HeadgearGlasses next, so if you have any links for specific styles, let me know. @Cailean: You can duplicate the current one-off eye holes and move them how you like for that effect. Or you could make two circle insignia and two Heads. Mask one insignia on one head, the other on the other one, and then make one of the heads invisible (set all colors to 0% alpha) to give you that effect. Or I can add one :-p That’s actually a good idea, I should do it. That’s just awesome i love the gas mask and can’t wait to use it, thank you so much i so love what you do with this new HM3 project ! Man, what a sweet set. Could be me, but have noticed Headwear can make or break a character. Perhaps has something to do with people’s identifying faces. These are amazing. I’m very happy to have these. Thanks! how bout a sports set. Hockey masks, football helmet,etc. I like how you seperated the parts of the gas mask. I’m sure some of the creators on the UGO forums will do some intereting things with it. How about some verticle or horizontal slits and or some type of mouth grills/breathing holes. i second the sports set. Brilliant work, Jeff! I noticed a native American-like face paint mask in there. I was curious if we could also get that in parts, forehead half and jaw-line half? Could we also see different versions of these face paint masks to mix and match? Can you tell I’m looking forward to tattoos? 😉 lol. For glasses requests, I’m thinking Riddick’s goggles and Ozzy Osbourne’s glasses? Thanks, Jeff. Do you need links to the glasses? Thanks Tim. Links are always more than welcome. For more flexibility, could some of the masks not have the eye holes, and a seperate set of standard eye holes be added? This would remove the need for skee masks entirely (Just color the head the color of the mask) and allow many of the masks much more flexibility without the need for the same mask over and over. So the individual colors could have a pattern. @Jason: You can basically do that now with a standard Head, the mouth/head-top pieces from Mask, and the eye holes in Eyes. @Eric: That’s a great layout, had I seen that when I was starting I’d have done it that way. Now, though, I fear it’s just too late — I’d have to go back into every single item and add two more mask layers and redo the code. Plus the patterning is already slowing things way down, having three patterns masked onto one object would triple the problem. You can get around it, though, by making two of the same item. Apply pattern1 to color1 of item1, and make line color and color2 0% alpha. Apply pattern2 to color2 of item2, and make color1 invisible. Stack them on top of each other and you’re good to go. Yeah, but it doesn’t work when turning one color invisible makes it the other color. Regarding the gas mask, what about splitting up the two filters so either or both could be added to the masks?